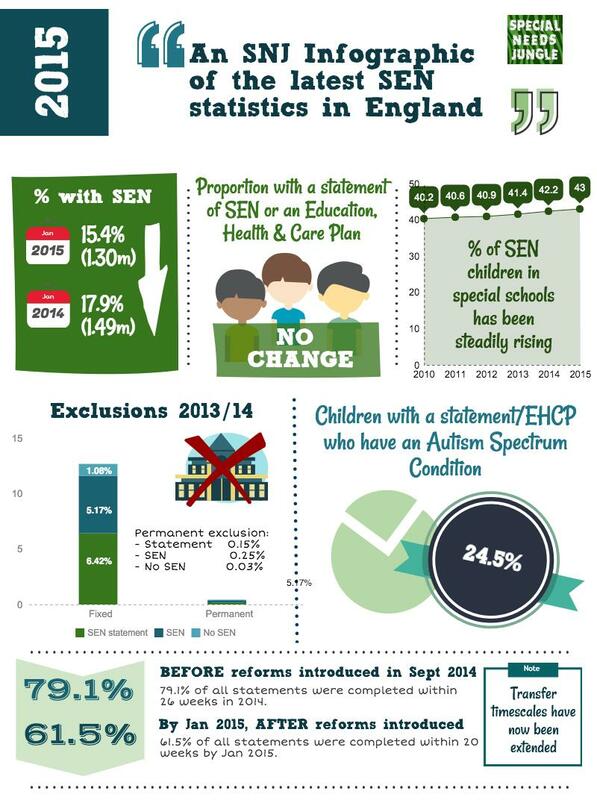 Last week the DfE released its annual "Special educational needs: an analysis and summary of data sources". It was late, as pointed out by our rather awesome columnist, @AspieDeLaZouch on his own blog, but the DfE insists there was nothing "sinister" about this; it was because of changes in the way the data was organised to try to make it more relevant and as up to date as possible. The data will now be updated twice a year. It's a summary of various sources of statistical data relating to SEN, pulled together in one handy document with links to the relevant information from whence it came. Despite it being a rather dry title, therein lies some fascinating information, including a summary of Tribunal statistics, absence and exclusions, attainment and progression and current experience of the new SEND system. So as to make it easy, I've constructed an infographic which is free for you to share, download, print and use as you will as long as due credit is given in a link back to this post. Remember, these figures aren't new, they've just been collated into a summary. Want to download this as a PDF? You can do so here Text is copyable.